The Pine Ridge and Cheyenne River Reservations in South Dakota are part of a larger territory established for the Lakota in 1868 by the United States government and later parceled out to non-Native homesteaders and broken up into smaller tribal reservations. Today, Pine Ridge Reservation is home to about 40,000 Native Americans and Cheyenne Reservation about 20,000. According to the US Census Bureau, the reservations lie within the poorest counties in the United States. The ONE SPIRIT Okini list is maintained by an international network of volunteers who are in direct personal contact with the people of Pine Ridge. Okini is a Lakota word meaning "to share material things". NEW - Hot Donor Deals! Click HERE to check out latest ideas and good deals or tell us about a great opportunity you want to share. ORGANIZATIONS -- If you can help these organizations, please get in touch! ALLEN YOUTH CENTER ALLEN EASTER DINNER: The Allen Youth Center is having an Easter Bash and needs some help. They are planning a ham dinner complete with the fixin's as well as as Easter activities and baskets for the children. 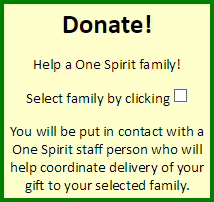 Because time is short, One Spirit is suggesting that interested donors use the One Spirit web page to donate to the Easter bash. One Spirit will then provide a credit at the local grocery store for the needed items. NEW LISTING: LEGOS to keep those kids busy! The center is requesting Legos, Duplos and cars and trucks for playtime at the center. BOOKS, BOOKS, BOOKS... The new program director at the Allen Youth Caenter is asking for your help in getting books into the hands of the Allen children. Donors sent a ton of Junie B books. Let's see if we can get some books that boys enjoy now! The children are from 5 to 17 years old. TO MAKE A CASH DONATION to the Allen Youth Center, please donate through the One Spirit website http://www.nativeprogress.org/en/. The center cannot process your cash donation. If you are interested in making a donation to the family, please contact us! we thank you for your kindness and generous heart. Your contact information will be kept private and not shared with or sold to anyone. ONE SPIRIT has donors worldwide. We greatly appreciate your detailed contact information! NEW To prevent duplicates we are now allowing only one donation per family every 5 minutes. Click ONCE to submit. Thank you!! SAVE when you have completed this information. Click SAVE my information when complete! The Okini program is a great way to make a difference in the life of a Lakota family. Upon receipt of this completed form, One Spirit will send a response to you via email. We will provide you with instructions on sending the items to your selected family. With this information, we will notify your selected family that your gift is on its way. If you would like to help a family on a more regular basis, please click the box below. The rewards are endless! Please send information on sponsorship.